Home » Angarrack » Village Information » Flooding & Angarrack Stream » Improving water quality in the Angarrack and Stennack – how can you help? Submitted by Angarrack.info ... on Sat, 01/12/2012 - 01:00. We want to improve water quality in the Angarrack and Stennack streams in Cornwall. 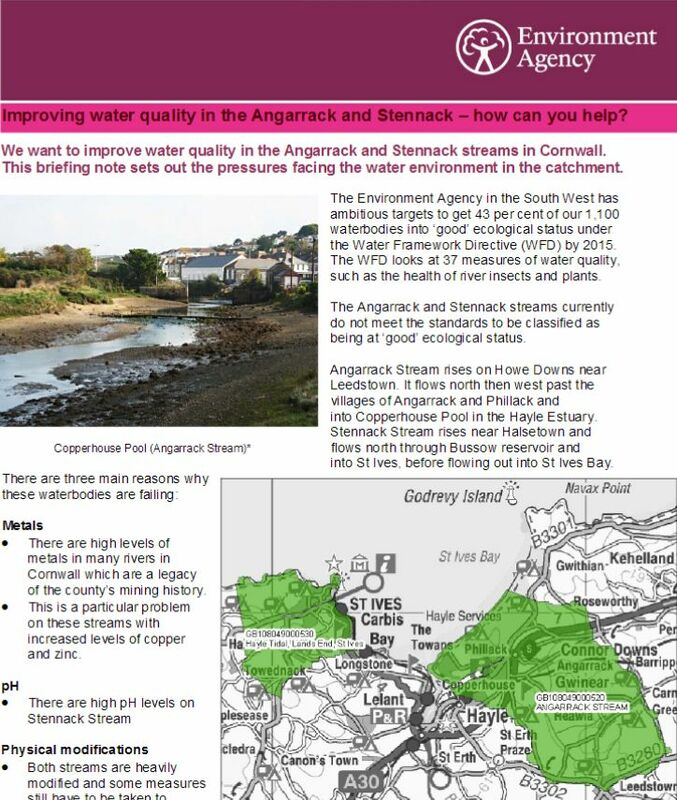 This briefing note sets out the pressures facing the water environment in the catchment. The Environment Agency in the South West has ambitious targets to get 43 per cent of our 1,100 waterbodies into ‘good’ ecological status under the Water Framework Directive (WFD) by 2015. The WFD looks at 37 measures of water quality, such as the health of river insects and plants. The Angarrack and Stennack streams currently do not meet the standards to be classified as being at ‘good’ ecological status. Angarrack Stream rises on Howe Downs near Leedstown. It flows north then west past the villages of Angarrack and Phillack and into Copperhouse Pool in the Hayle Estuary. Copperhouse Pool (Angarrack Stream)* flows north through Bussow reservoir and into St Ives, before flowing out into St Ives Bay. • There are high levels of metals in many rivers in Cornwall which are a legacy of the county’s mining history. • This is a particular problem on these streams with increased levels of copper and zinc. • Both streams are heavily modified and some measures still have to be taken to reduce the effects of physical modifications on these waterbodies. We are gathering further information to help us identify sources of pollution and understand how the physical modifications are affecting the ecology of the streams. • getting involved in projects to improve water quality and habitats in this area. Please contact Daniel Hambrook on 01208 265087 or email: AEPDevon&Cornwall@environment-agency.gov.uk if you’ve got information or ideas that could help, or want to get involved. Would you like to find out more about us, or about your environment? Approximate call costs: 8p plus 6p per minute (standard landline). Please note charges will vary across telephone providers. tags for Improving water quality in the Angarrack and Stennack – how can you help?